Some days I feel flawless, but most days, being perfect isn’t plausible. From career to finances, from family to friends, from fashion to makeup….it’s impossible to keep up. That’s never stopped me from trying. 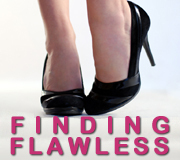 My definition of flawless has changed over the years, and it’s probably different from yours. But while trying to achieve what I believe is the ideal, happy life – I’ve learned some things. I started this blog to share them. I hope you like it!